FL-293 (Mid-Bay Bridge Connector) to Lakeshore Drive exit, follow signs to Maxwell-Gunter Recreation Area. The toll bridge is $3.00 for one vehicle with two axles and an additional $3.00 for each additional axle. Accepted. 6 months in advance for active duty, 4 months in advance for all others. Pets allowed with usual leash and clean-up rules in the campground ONLY. Pets ARE NOT allowed in the rental cabins. Cabin prices vary based on rank, type of rental and season (or holiday). 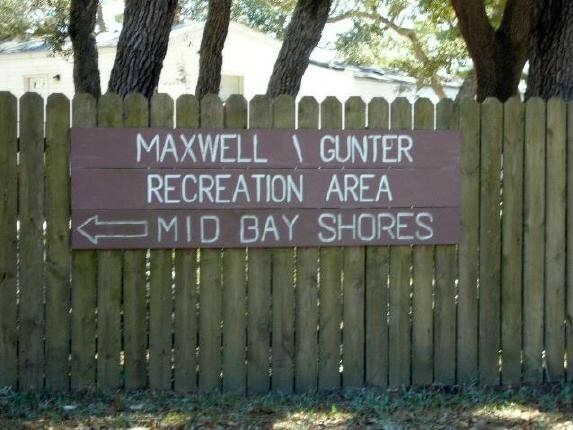 Mid-Bay Shores, Maxwell/Gunter's Florida resort location opened April 2003. 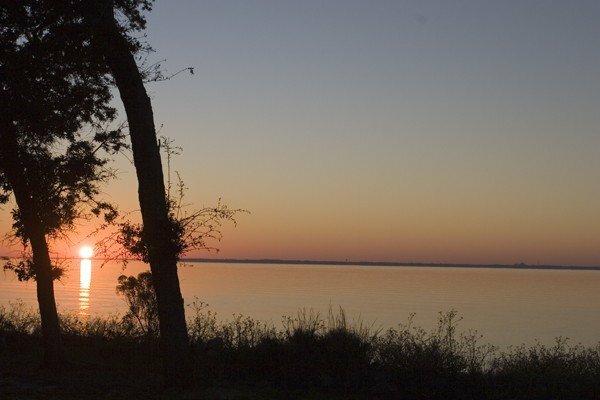 Formerly called Lake Pippin, the new name, Mid-Bay Shores, was chosen to better reflect the beautiful white sandy shores of Choctawatchee Bay that the resort faces. 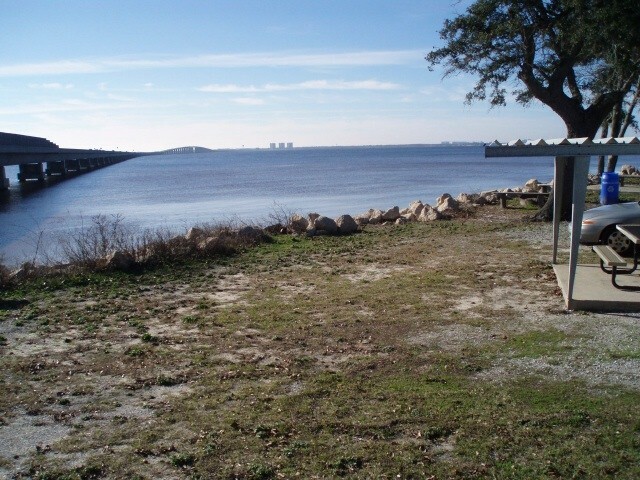 The gated entrance is just before the Choctawatchee Mid- Bay Bridge, a toll bridge that connects Niceville and Destin. Cabin guests must bring their own linens. 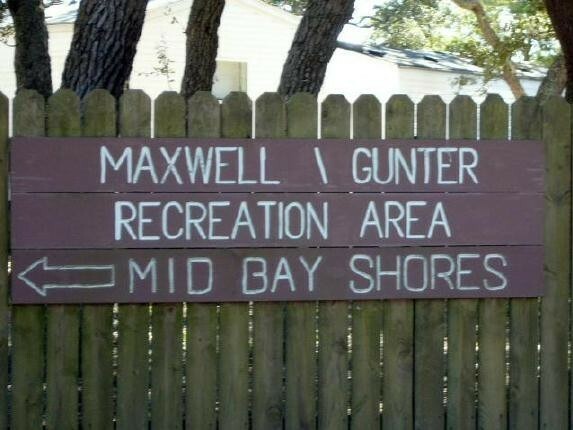 Mid-Bay Shores, Maxwell/Gunter’s Florida resort location opened April 2003 with 25 new fully furnished cabins. 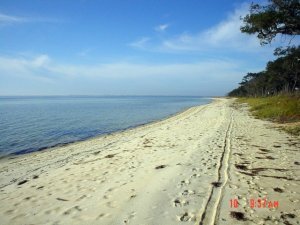 Formerly called Lake Pippin, the new name, Mid-Bay Shores, was chosen to better reflect the beautiful white sandy shores of Choctawatchee Bay that the resort faces. 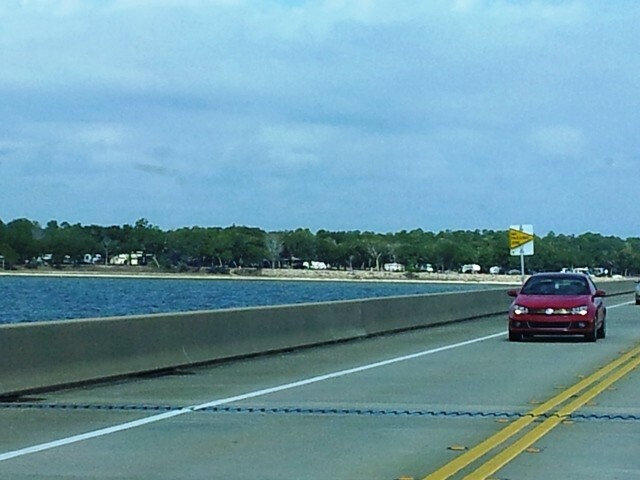 The gated entrance is just before the Choctawatchee Mid- Bay Bridge, a toll bridge that connects Niceville and Destin. 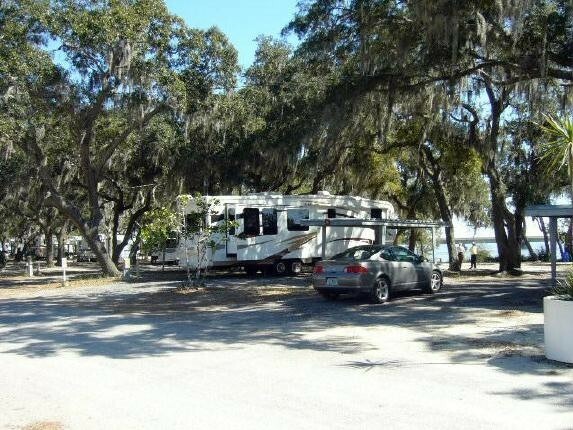 The rebuilt site now offers the 25 new furnished cabins plus 28 RV spaces with full hook-ups – water, electrical and sewer, and six overflow sites with just water and electrical hook-ups. 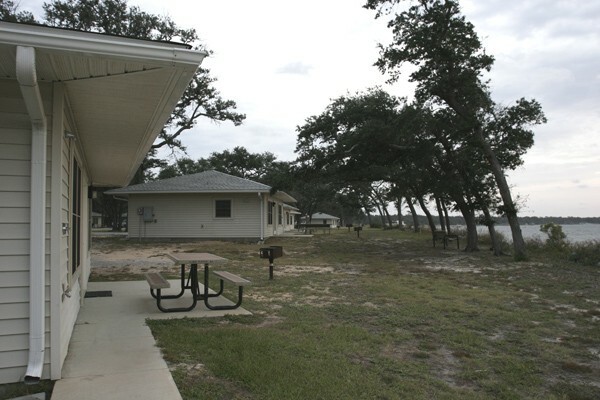 Visitors have access to barbecue grills and picnic tables next to their facility. There is also a new bathhouse with laundry facilities. The cabins are two-bedrooms with large closets, one bath, large living room and eat-in kitchen. The kitchen offers a full size range and refrigerator and dining table with six chairs. The living room has a queen-size sleeper sofa, two chairs, tables and lamps. The main bedroom is furnished with a queen bed, bedside tables and lamps. The second bedroom is furnished with a queen and a twin bed. The centrally air conditioned – heated cabins also have a color television for relaxing. There are window treatments for privacy and bedspreads on the beds. Visitors must furnish their own linens and towels. 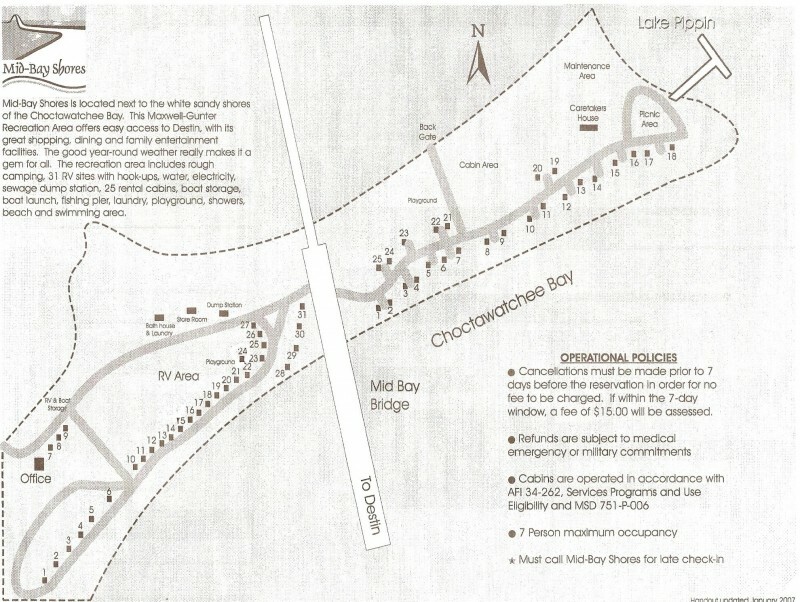 Brochure, prices, and map of Mid Bay Shores Recreation Area. We have been camping here for 6 years. Its my favorite spot to camp! 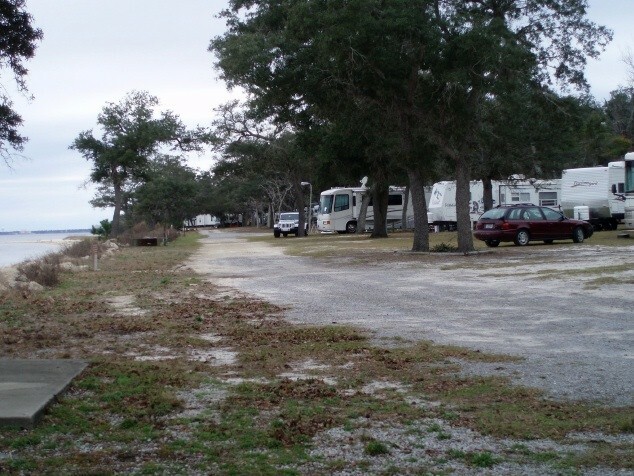 Campground is always super clean, to include each lot and bath house. The office staff is always so nice and very accomodating. There is no pool at this campground - only draw back. The price is great compared to civilian camp grounds. Absolutely RIDICULOUS PRICES for any military member! This was our very 1st experience with a new RV, me and the wife have never owned an RV before. 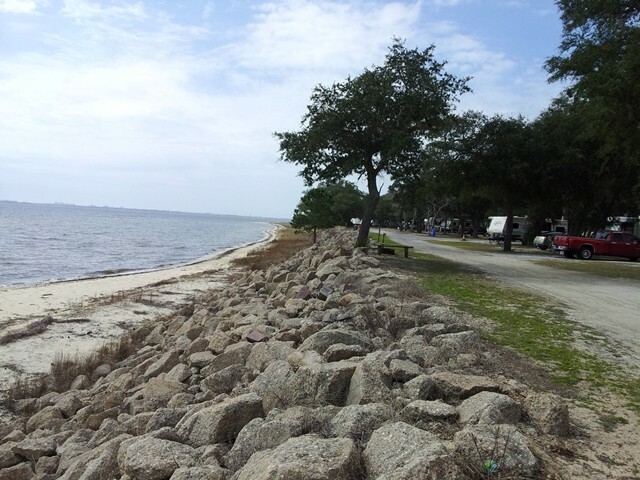 I can only hope all campgrounds are as nice as Mid Bay Shores, we will defiantly be going back, view from the RV was great and the staff was super friendly. great place to stay! Very well kept secret. 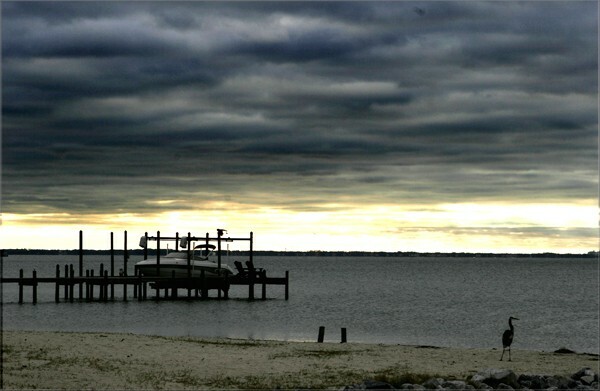 Outstand view, right on the intracoastal waterway. Outstanding services (TV cable Wifi) and ice. Beautiful sunsets, good walking beach. I will be back. First time visiting Mid-Bay Shores. Stayed in a cabin. Excellent facility. 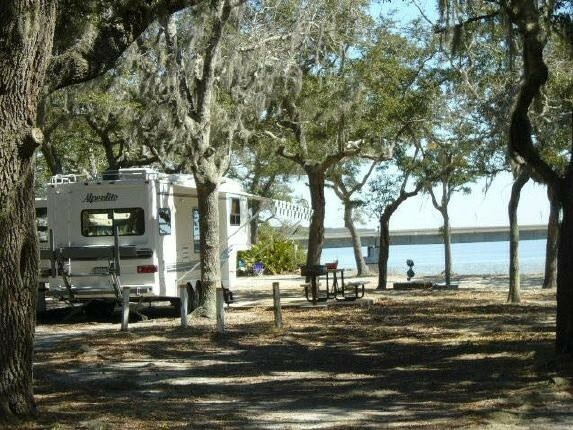 Quiet, restful, clean, close to Destin ($4.00 toll each way to visit Destin). Will stay in this facility again. Didn't have a lot of interaction with staff, but what little interaction I had they were friendly and helpful. Very convenient facility. We were visiting friends in the Niceville area and this was perfect. Roomy sites. The campground itself is pretty dated. The sites are mostly level and are primarily sand with some gravel. Very nice water views from most all sites of the Bay. The wifi was probably the best I have ever encountered at an RV park. Cable at all sites. Many of the sites of trees in the way of getting a satellite to lock on. 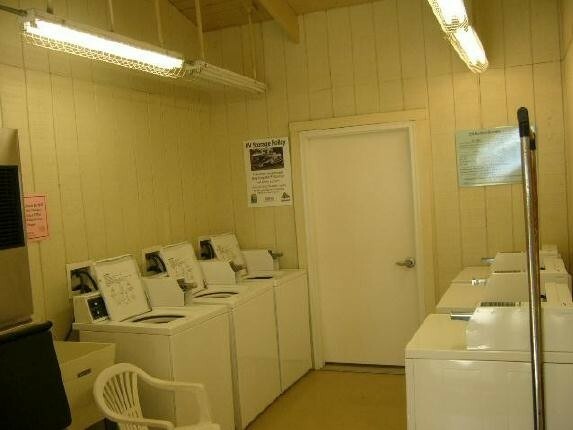 The restrooms and laundry were clean and very usable, we did some laundry here. Be sure and follow the directions from this site and follow the brown signs and it is easy to find. If you come up from Destin be prepared to pay a $4.00 toll plus $4.00 for every axle over 2. We would definitely stay here again. What a great time we had. Oct 10 - 24. 2016. Great location, wonderful campsites and sandy shore for walking, swimming or su nning. #1 on our list of places to return to. Quiet. Camp host and staff are very helpful. 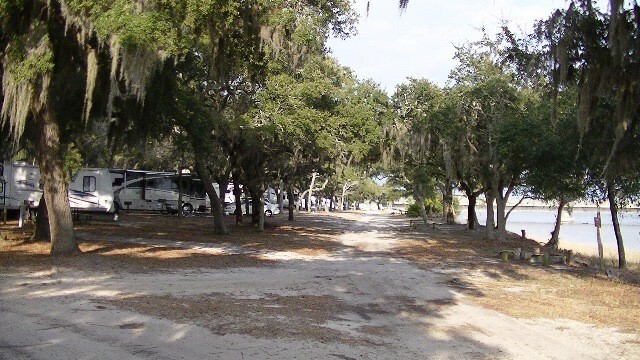 The campground is full of live oaks and Spanish moss and most sites are shaded. It was never full and quiet at night. Access to the beach is limited to 3 or so places. Aggravating to FL, no pets are allowed on beaches. Even though the campsites aim toward the bridge, the noise is very low. Don't go into Niceville Saturday afternoon, huge traffic trying to go to Destin ties traffic up getting back to campground. Nice vile is not touristy at all. BX is 30 minutes. We would go back. The facility is in a good location, and the staff are nice and easy to work with. 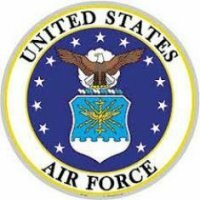 My wife and I stayed in one of the trailers and found it to be well below the quality we've come to expect from an Air Force facility. The trailer had bugs, the mirror on the bathroom was barely hanging on, the bed blankets were dirty, and the living area furniture looked like it came from a low level yard sale. We were not at all pleased with the quality of the trailer and will never stay in one again. We were fortunate to find a place so late in the season, and while we are thankful to find something, this place needs to either upgrade the trailers or take them out completely. Again, the accommodations were well below the other Air Force facilities we've utilized in the past. We would probably visit again. The road off the main highway to the campground is recently paved which is a big plus. The Location is also good and love being on the water. It was pretty rustic, almost rough but it turned out to be OK. Looks like there have not been any upgrades or real maintenance on the property in a while. That being said, it was a good location. The trees prevented us from getting satellite coverage but I saw that a few with mobile dishes got a signal. My neighbor let me use his cable connection so we had TV for the weekend. Recently stayed May 31 - June 4. The cabins were great and the staff very helpful. I have been coming to Mid-Bay yearly since 1984. This rec facility has been going downhill over the years. 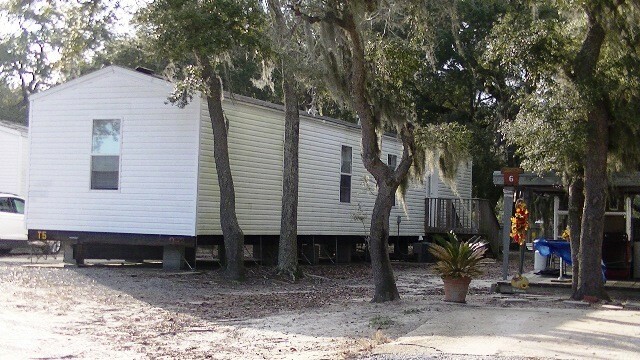 Yes, the cabins are a great replacement for the old trailers. However, this was Memorial Day weekend and the dock was closed; the stairs leading to the deteriorated beach were closed and they looked like they had been closed for quite a while. The beach is pitiful; no one takes care of it. Used to, we had a beach and someone (the Caretaker) used a 4-wheeler and swept the beach of litter. The beach today is about 2 feet wide because of the rocks filled in. I understand the years past hurricanes that took a toll, but it has been years since that happened and not many improvements made other than the cabins. I love the area, but over the years it has gone downhill. We stayed the weekend of 4/24-25-26 and it was beautiful. We absolutely love this park, beautiful sunsets, wonderful location and peaceful area. Still no wifi in the RV's, managers are nice people but no improvements have been made in the park in all the years I have been coming here. 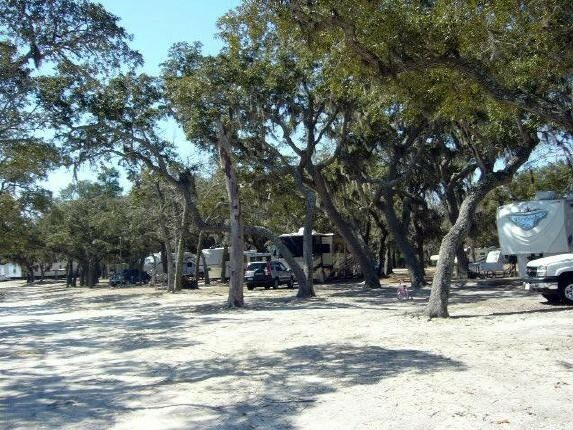 A few homesteaders are still allowed to stay in the park, lax enforcement it appears and good old buddy network appears to exist in getting sites for more than a few days. This could be a beautiful park due to the location but it needs major attention from Maxwell brass, appears that will not happen. This is my fourth time at Mid Bay Shores. It is a most pleasant place to relax and spend some time. Eggy and Rock are the absolute best. They and their staff have done everything they could to make my stays comfortable, relaxing and easy. The amenities I desire are here with the exception of Wifi throughout the campground. A fitness building is there for rainy days (with Wifi). And the great outdoors beckons when the days are clear. That's when I indulge in my hobby - plug an audio book in my ears and head out picking up trash along the roadsides and picnic areas. If you feel like going out there are lots of choices for meals, movies, shopping and beach; and if you feel like staying close you can relax, fish, exercise, watch one of the free DVDs on loan at the office, or take a nap. Mid Bay Shores may be a bit rustic for some but I love it here and plan to be back every chance I get. "The Trash Lady". 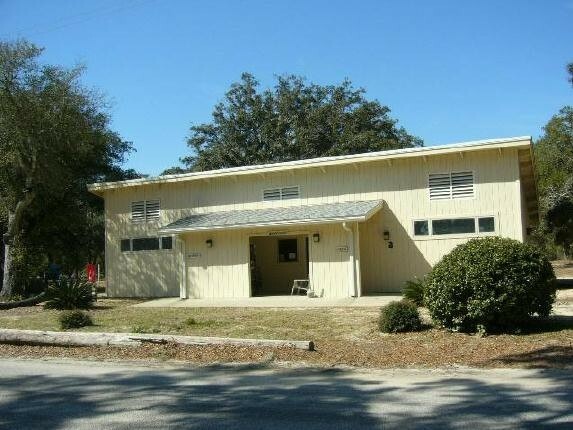 Operated by Maxwell-Gunter on Eglin property. There are no manicured grounds here. Nor are there any concrete pads; or any amenities other than a bathhouse and laundry ... and kayak rentals from the campground office for $5/hour. The campground is rustic — and more than a little rundown ... doubtful it will be upgraded anytime soon. That said, we really enjoyed our stay, and Eggy was a wonderful, friendly hostess. There are plenty of shade trees; so not all sites are big-rig suitable. 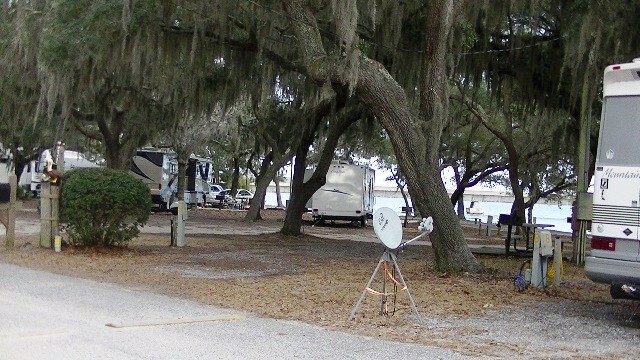 As well, the trees block satellite signal in some sites, but with our tripod dish, we had no problems getting the feed. There’s no wi-fi, but our Millenicom Mi-Fi (Verizon service) got a good 4G signal. There is free cable. The beach is little more than a strip of sand, and at the time of our visit, was filled with beach wrack. Campers who'd been there for a while told us the beach had been pristine just weeks before, so must be a seasonal thing. Fishermen were out all day ... some in kayaks, and some in waist deep water fishing with nets. Nice variety of bird life. Destin and the sugar-white beaches of the Gulf are just across the Mid-Bay Connector ... $3/car each way to cross, but convenient. Quite a drive to get to the commissary at Eglin. Again, we stayed here only because it's location is excellent for what we want to do here. The park is still in a run-down condition and it doesn't look as if it will be fixed any time soon. Thee are several dead trees that if not removed will fall on someone's RV some day. There also seems to be about 8-10 sites being used by permanent residences. 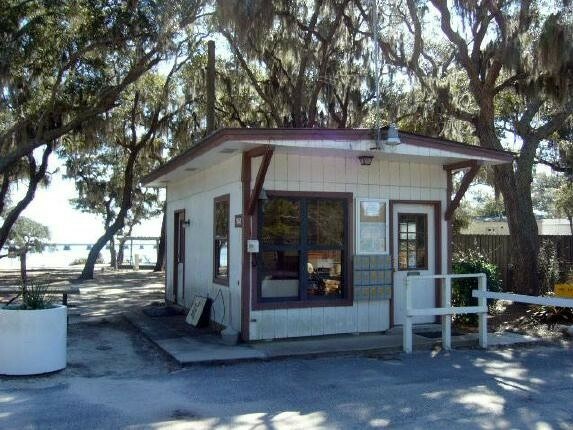 One positive note: The little shack with the Wifi router is closed and scheduled to be torn down. The scrap container is already in place. 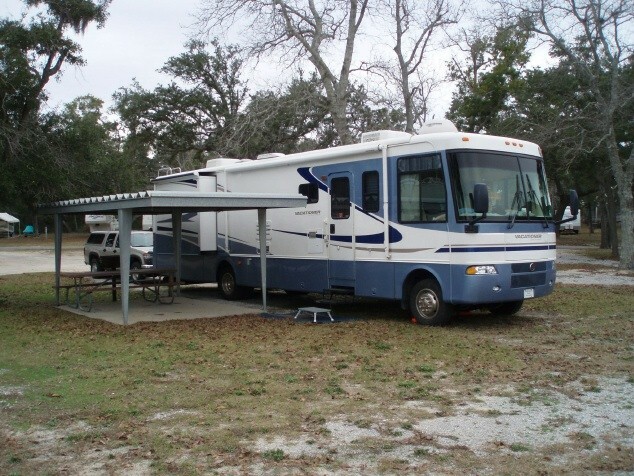 The manager said that a better Wifi system is scheduled to be installed and Wifi will be available inside your RV. You won't have to go to the cabin being used as a gym. They have taken out the table and if you go there you will have to put your computer in your lap. They replaced the table with more exercise equipment that no one uses. I think the managers are trying to do a good job but their hands are tied and can only do so much. But. We will probably be back. We stayed here the month of January 2013 till the first week of Feb. We had a great time visiting Destin and the local area. We were in site 15 and all was well. They do need to put more money in the place but that was not what we where here for. We went fishing most days across the street on the beach and on the pier. The amount of fish at the pier was tremendous. We even saw porpoise swin by while fishing on the pier. We were not lookinig for the best park but one where we could see the area and feel secure. Washers and dryers are one dollar and the wifi has to be accessed at the offfice or weight room. We would stay here again on the way by. We have stayed here in the cabins about 4 different times. I would like to say that every time we have stayed here, the staff is so friendly, the cabins are always so clean and it is close to anything you would like to do. The water was not great this time but we can't control mother nature. This was the first time for my daughter to visit with us and she was just in aww. We had a great, relaxing time and we will positively be back next year. 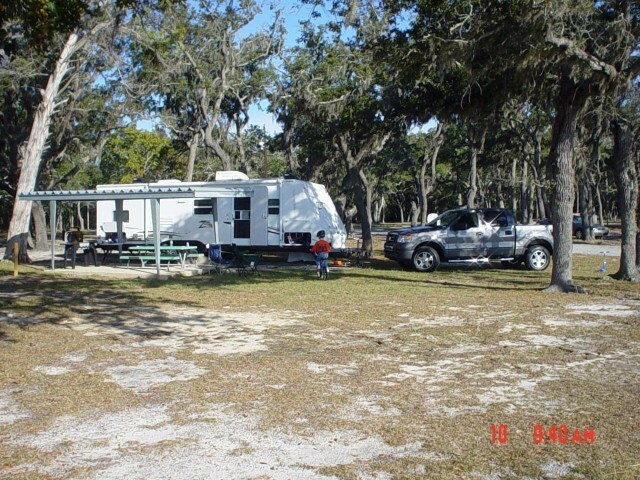 Thanks again for allowing us to stay at your recreational area. As usual we had an enjoyable stay here. The place is run down and looks as if very little of the money taken in is put back into the park. The shack with the WiFi router needs replacing. The patio covers need to be torn down. They are rusted so bad you can't sit under them because whatever falls on them falls on you. There is at least five trashy looking sites. 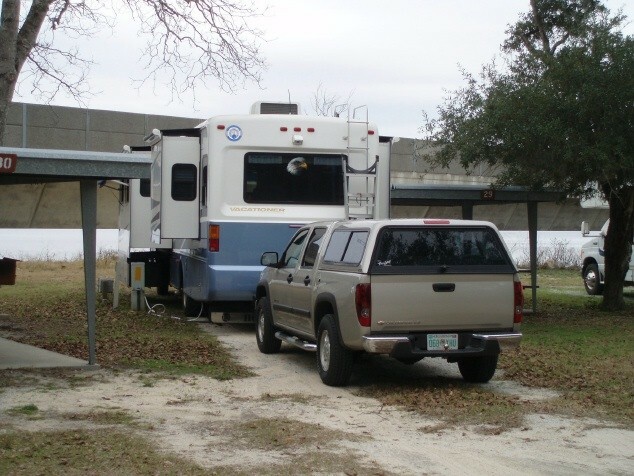 One site had a travel trailer, utility trailer, boat trailer with boat, a pickup truck and an SUV. The patio was filled with very large furniture and you couldn't get another thing under the trailer. One site had 3 large BBQ grills. Several sites had refrigerators on the patio. I'll never understand why management lets these situations get into this shape. The WiFi shack is terrible. We went down to the cabin area to use that one but the table that was in there was replaced with more exercise equipment that no one uses. A note for those expecting to turn right out of the campground onto the Bay Bridge. You can't do that anymore. You have to turn left onto White Point Road and go to Highway 20 and make a right and drive about a mile to the new entrance/exit road to the bridge. With all this, we keep coming back and will come back again. It's a decent enough place for us to do our running around from. 4-9 March 2012. First time visiting Mid-Bay Shores! Really enjoyed our visit! Weather didn't exactly cooperate but we got to explore the area some and definitely read & rest. One great point: We had no idea about finding a good recommendation for a charter fishing trip and staff did not know but we found out and visited the U.S. Army Destin Recreation Area (again open to all services) which is just across the bridge; they have charter fishing boats that are dedicated to the military and you can sign up for fishing trips! 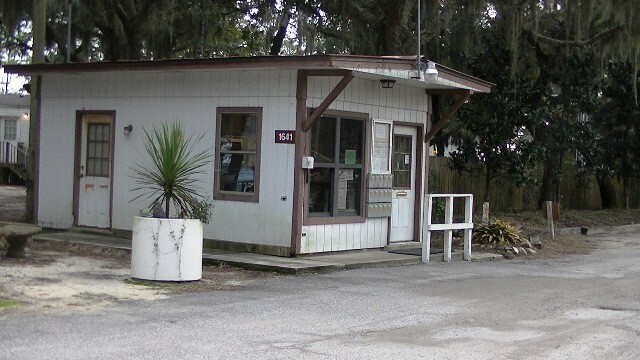 Mid Bay Staff was great, helpful, pleasant and easily accessible w/ radio at gate shack. We rented a cabin (#10) and we had 7 people. This worked out great to have a full kitchen available and a charcoal grill available for each cabin. Some issues that could be considered for improvement: 1) We needed the queen-size fold-out sleeper couch in the main room; it had a horrible mattress but finally asked staff who promptly switched out mattress w/ brand new one; Staff may need to check all couches in every cabin on regular basis for condition of the mattress. Also, spings in couch when closed were broken....entire couch may need replaced. 2) The access road going to park and also the road in the park are in very bad need of repair. Dangerous to navigate when coming in to park and navigating in the park in the dark. I would think that the road from the highway to park entrance would be covered by state since it leads to the state park right next door to Mid-Bay. But, the road inside the park would be Air Force and really could use an upgrade. 3) The fishing pier: Really nice "private" pier; pier does need some attention- the railing is "fragile" and a potential safety hazard; also lights not working or not enough on the pier. 4) Signs for park entrance should be repainted each year. 5) Would be nice to have high-speed internet or even WI-FI service available throughout park as it is definitely close enough to civilization for easy hook-up; very small "rec" center was only area w/ and was constantly occupied for hours. Thanks again so much for a great area to vacation - beautiful! quiet! well cared for overall! Colonel Nancy W.